Warden Shoemaker: No remorse in your heart. Just like an animal. Robert Stroud: "Ain't that what these cages are for? Animals? Birdman of Alcatraz is one of those unique historical dramas. Although based on real events, Birdman slightly altered the reality of the story by making it a bit easier to take for the average viewer. This doesn't make the film any less grand, but it does ask an important question: If a film that's 'based on a true story' skews the real story, does that destroy the good things within? In this case, I'd have to say no. While the true story is cleaned up a little for the purposes of dramatic license, the superior content certainly excuses that. Birdman of Alcatraz (based on the book by Thomas Gaddis) tells the story of Robert Stroud (Burt Lancaster), a born felon who has spent almost his entire adult life behind bars. As the film begins, Stroud is transported to the infamous Fort Leavenworth. Convicted of murder, Stroud faces many years in this dismal prison. The warden, Harvey Shoemaker, tries to mold Stroud by imposing rules upon him and making sure he follows them to the law. Unfortunately, Stroud's temper causes him to have an argument with a guard that turns deadly. Stroud kills the guard, finds himself convicted for another murder and given the death sentence. His mother, obsessed with his well-being, manages to successfully petition the President of the United States to commute his sentence to life-in-prison. However, this term must be carried out in solitary confinment, for the rest of Stroud's life. Faced with this depressing prospect, Stroud descends into depression and mind-altering boredom. Everything changes when, for some strange reason, the hard-hearted and mean-tempered man decides to take in a baby bird he finds in the exercise yard. Eventually, he begins caring for the bird on a regular basis and raises it to adulthood. Eventually, his privleges for caring for the bird are expanded, and he is allowed other birds as well, mainly canaries. Seemingly, Stroud finds peace taking care of these animals and eventually becomes so adept at it that he even publishes articles about bird care. The entirety of the film essentially tells the story of Stroud's life at Leavenworth, and how it evolves into different things, including marriage to a woman who read his articles. Later in Stroud's life, he was transferred to the equally infamous Alcatraz Prison, where he was not allowed to raise birds. 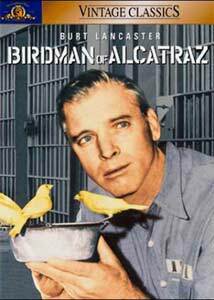 So, it's odd that he became known as the 'Birdman of Alcatraz', since he did all of his canary care at Fort Leavenworth. Regardless, this is an excellent drama that's very well made and handled by director John Frankenheimer. Although in reality Stroud was a much meaner, more difficult person (who actually killed 2 people in prison, not just the guard), Burt Lancaster's classic performance simply cannot be understated. Lancaster (who I once had the honor of meeting in person) is a wonderful actor who brought so much emotion and depth to the characters he played. Here, things are no different, and he actually exudes a kind of menace as well as a tenderness. The general style is worthy of praise, as well. Considering the majority of the story only takes place in Stroud's cell and the nearby area, the slick camera work and wonderful cinematography bring an amazing about of variety to what is done with the various scenes. The composition is impressive, but at the same time it's almost impossible to think how it could have been made in color. Black & white seems almost a requirement for this tale; a fitting prison gray haze put over the whole thing. Birdman is one of those larger-than-life experiences, where the sum of the acting, writing, and directing makes a work of art that can't be easily classified. It's an epic drama that deserves its reputation and it's one of Burt Lancaster's finest moments. Image Transfer Review: Birdman of Alcatraz is presented in its 1:66:1 theatrical aspect ratio, which is only a very slight matting on the top and bottom. The absence of anamorphic enhancement is a bit of a dilemma, since it's debatable whether or not it would have made the image better. That aside, the film looks very good. Despite being a grainy, black-and-white movie, there are no instances of shimmering or pixel movement. Everything is extremely clean and sharp. The source print has some damage in certain places and the reel change marks have not been removed, but this is pretty minor. This is one of the best black & white transfers I've seen and it should make fans happy. Audio Transfer Review: A Pro-Logic Mono audio track is used here. Although some dialogue seemed a bit quiet at times, most of the track is very clean and perfectly audible. The musical score sounds good as well. Extras Review: Given the classic status of Birdman, the treatment here is a little sour. Firstly, there is only the theatrical trailer. No making-of feature, no interviews, no nothing. What makes this more disturbing is the total lack of even decent presentation. The cover art is arguably the worst I've ever seen, in terms of altering the original art. MGM used an awful, fuzzy photograph of Burt Lancaster superimposed on a picture of the prison, then colorized it. Being part of MGM's new DVD series, it also carries the label of "Vintage Classics." There is also NO keepcase insert which means that there is no guide to the chapters (other than the chapter menu on the disc). Ouch. If you can overlook the icky, barebones presentation, this dramatic epic is a worthy purchase. The big fanbase may want to wait for a better re-issue and just stick to renting. Either way, the film itself is highly recommendable.